Missed Connections: Kismet, destiny, and fate; all of which can be life changing and earth shattering. You never know where one of these fortuitous encounters might happen — in far off exotic locations, where love is all but inevitable, or, alternatively, on Route 10 in majestic Chesterfield County. Yet regardless of where you were this past week, someone else was there, which is why RVA Mag has rounded up the best near misses in the River City. “You: Dark and handsome with the friendliest smile I’ve ever seen. You were walking with two other gentlemen toward the escalators. Me: Light complexion, hair up, pink shirt and black pants, infinitely enchanted with you. I’ve never written one of these before… I feel so silly and know the chances are almost nil. Mission Barbecue on West Broad St.
Until the completion of I-95 through central Virginia in 1958, the Jefferson Davis Highway comprised the economic backbone of the region. All north-south traffic from Maine to Florida flowed along Route 1 and brought with it the wealth which supported a corridor of bustling manufacturing, small businesses, and vibrant communities. Sixty years later, Jeff Davis is home to the deepest and most intransigent pockets of poverty in Chesterfield County—a prosperous part of the state with an average median income nearly fourteen thousand dollars higher than the overall Virginian. I-95, the Powhite Parkway, and Route 288 have all pushed development further south and west across the county, gobbling up pristine farmland in favor of subdivisions and strip malls. Chesterfield’s population has quintupled over the decades since the county’s first interstate, and its Board of Supervisors has been frenzily stoking that expansion by channeling Chesterfield’s resources into the necessary infrastructure for new development: roads, water, sewer, schools, and firehouses, etc. Route 1 residents’ cries for investment in the corridor have long fallen on deaf ears as greenfield development is cheaper and easier than the complicated and less glamorous task of revitalizing older areas. 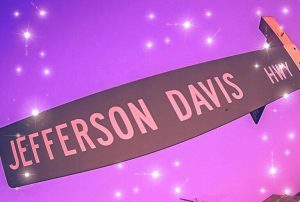 A plan to improve the fate of Jeff Davis in the 1990’s was implemented half-heartedly at best. However, neglecting the area also comes with costs; the low property values along Jeff Davis are a drag on the county’s coffers while thousands of far-flung Chesterfield residents waste time and money on frustrating commutes to work in Richmond. The economic and environmental absurdity of ignoring that part of Chesterfield, which is most strategically located next to the region’s economic powerhouse, may have finally dawned on county leaders, but will the recently approved Northern Jefferson Davis Special Area Plan be a first step toward the area’s revitalization or just another empty promise? Marble, for one, is hopeful, saying, “I like that [the plan] is ambitious, innovative, and pushing the envelope of what could be. 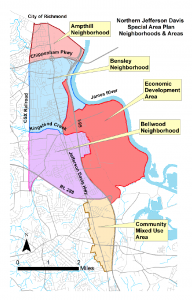 I also love the fact that it could possibly raise the ceiling on the hopes and dreams of other struggling communities.” If Chesterfield County prioritizes the corridor’s revitalization, she believes Jeff Davis could become, “a thriving family-friendly, multicultural, innovative, charming, and walkable corridor where people desire to live, work, and play” within a decade. The plan certainly holds a lot of promise, outlining mixed-use and mixed-income communities, fresh streetscapes, and a 3,800-acre Technology Zone which county leaders hope will attract private investment into the area. Marble hopes the enthusiasm surrounding the new plan will build momentum towards a full rejuvenation of the corridor. The JDHA has been working with county and community leaders for over two decades to plant the seeds of a new start for the area. So far, their accomplishments include the designation of the corridor as an Enterprise (now Technology) Zone, the founding of BizWorks—a non-profit small business incubator—the Historic Route 1 designation, and the installation of new streetlights and banners celebrating the region’s history. Many residents hope the 400th anniversary of the Falling Creek Ironworks next year will draw further attention to Jeff Davis’ many assets. The development of the 3,800-acre Technology Zone has also proved worrisome. The two billion dollars of private investment and 2,000 new jobs Chesterfield County has been promoting on the site by 2020 would come from Vastly–a Chinese-owned company which recently changed it name from Tranlin, Inc. following a firestorm of bad press after it failed to repay a $5 million dollar grant from the state due to unexplained project delays. Vastly’s plans for a paper mill on the site began to falter after it failed to acquire the necessary environmental permits in a timely manner. Although Vastly has promised to produce its paper with an as yet undisclosed new “green” technology, some Jeff Davis residents fear the new paper mill would be just another example of environmental injustice–the all too common phenomenon in which local governments or companies pack pollution and environmentally detrimental infrastructure into low-income and/or minority communities. One of Jeff Davis residents’ key concerns has been the lack of a timeline in the plan. There’s nothing stopping county leaders from beginning several long-term processes that will be key to the revitalization of Jeff Davis such as rezoning or developing funding strategies for big ticket items like the streetscape project, yet locals haven’t heard of any action on either front so far. Chesterfield County Planning Commission Chairman Gib Sloan has assured that a timeline will be the first priority of the steering committee he is currently putting together. Jim Holland, the county supervisor for the Dale District in which Route 1 lies, has requested quarterly updates on the plan’s implementation with the full backing of the Board of Supervisors. Two critical developments indicate the Board of Supervisors mean business this time around. A county-commissioned transportation study due out this year could call for a new partnership with GRTC to bring public transportation to Chesterfield in the form of bus routes along Route 1 and Route 10. Finally, the Maggie Walker Community Land Trust recently received approval for a large community development block grant from Chesterfield in the amount of $500,000 for FY 2018-19. Kirk Turner, director of the newly minted Department of Community Enhancement for the county, believes the land trust could be a key tool to neighborhood stabilization and the creation of long-term affordable housing along Jeff Davis. In the meantime, Marble hopes Chesterfield County will begin to signal its commitment to the corridor’s rehabilitation through a series of short-term fixes. The county could take the lead in fundraising for the 400th anniversary celebration of Falling Creek Ironworks and the rebuilding of the historic old stone Bridge at Falling Creek. After ownership of its building changed in November, Place of Miracles Cafe—a non-profit feeding warm meals to needy families in the area—has been trying to convince the Board of Supervisors to allow it and a band of other non-profit groups to use the now vacant Perrymont Middle School as a base from which to serve the community. Lastly, Chesterfield’s Economic Development Authority could turn its focus from the “Matoaca Mega Site” and instead prioritize investment and assistance to existing business along Route 1. Marble recognizes that revitalizing Route 1 will require sustained engagement from Chesterfield’s leaders and says local residents and clergy have been, “praying for a change of heart in and toward the corridor for a few years now.” She hopes that, “Citizens who live in more stable regions of the county will begin expressing their concern and support for areas in need of revitalization” to county leaders to encourage them to see the resurrection of Jefferson Davis through. Though she understands the concerns of both sides in Virginia’s battle over Confederate-named places, she hopes the substantive change of fighting poverty, increasing affordable housing, and improving transportation along the corridor won’t get drowned out by the debate. Battle died for being black and visible outside of his own home. While I didn’t know him, I know that his death means something terrible to me and for Richmond. This doesn’t match what his family must be feeling, but if white people don’t start taking seriously what the implications of this case are the consequences will be no less dire or painful. I spent the years during the 2006-2008 primaries and election working in Ashland, Virginia, in a business that served the construction, maintenance, and remodeling of commercial and residential spaces. During this time, I tried my best to communicate to my friends and loved ones the things I heard about women, black people, the LGBTQ community, Jews, liberals, feminists, Muslims and all manner of folks, being vocalized on a daily basis. It was something the people in my life just didn’t seem comfortable talking about. This was not some fringe “alien reptilians run the world” conspiracy either. These vocal violent fantasies were a daily occurrence. The slurs based on race, gender, sexual orientation, gender identity, religion, and the pure hate and wish for violence whispering underneath it all shook me – severely. I became a gun owner soon after. I could never shake the amount of desire to do catastrophic harm to the “others” that I’d heard so often or so freely expressed. These rants all had a desperate state of fear that some-insert any slur for hated people here- were going to take their material possessions or their sense of security or status. It was no shock to me then that in 2015, when a group of white men was arrested for planning to bomb black churches and Jewish synagogues around Central Virginia. Following reports of hate groups like these led me to demonstrate against them in Charlottesville on August 12, 2017. I saw these fantasies become reality before my own eyes – it was their coming out party. Whatever your thoughts on President Trump might be, my fears have become more acceptable and normalized with his “some good people on both sides” comment. It was a signal that the old rules and norms were now obsolete. More than anything else, it is also what well-meaning white people have missed. How can we go back to normal when those rules no longer exist? They have been obliterated. Those seeking to undermine equality always count on what well-meaning white people do best; have feelings, but stay away from the hard conversations and actions as they go about their lives. So far, those committed to hate and division are making the correct assumption; that they can rely on the majority of the white community to do nothing even if we morally sympathize with the victims of these crimes, like Battle. Battle’s murder was representative of the violent white-supremacist fantasy I heard a decade ago while working in Ashland. His death was an extension of the terror the black community has experienced through a history of lynchings – something we’re only just beginning to even be realistic about – much less come to terms with – look no further than the controversy over the lynching memorial that was just revealed in Alabama. Despite this, the tide of hate is rising again, all one has to do is look. Battle was lynched – right down to the white resentment expressed following his murder. Yet it doesn’t escape me that those with the violent fantasies I’d heard so often were not way just contained to black people – it is why I bought a gun. So what can we do? We must eject the purveyors of hate from our lives. Arguing about the merits of punching Nazis or the esoterica of free speech is no longer effective. Take the following example: a father who disowned his son after finding out he had participated in Unite the Right in Charlottesville recounted the way his son expressed his hate. His son said, “The thing about us fascists is, it’s not that we don’t believe in freedom of speech. You can say whatever you want. We’ll just throw you in an oven.” This young man chose being disowned over ending his participation in the growing culture of hate. While we might be far from the horrors of the concentration camps right now, we’ve already seen too many people killed. We can do this because, in the end, those that hate will always need all the people they claim to hate. Nonetheless, while we still outnumber them, they have the motivation to act that we seem to lack. We need to make them afraid to speak, much less act. We must confront the fact that we’re afraid of them now or be forced to accept the fact that they can be allowed to act on their violent fantasies. The SPLC reported that the FBI’s hate crimes statistics have been on the rise. The last time the statistics were calculated in 2016, there was a 10 percent increase to 6,121 hate crimes from 2014. Of those, 1,273 were related to religion, and 1,076 targeted the LGBTQ community. How many more increases can we afford in this political climate? This is costing real lives, as we have just seen right here in Richmond with the death of Battle. Every one of those crimes emboldens the forces of hate and gives them a hero. It also potentially brings us closer to a confrontation where we have to stand up for our neighbors and communities. We should not have to live this way. Steam Bell Beer Works, the first stand alone brewery in Chesterfield, hopes to be serving up cold ones before year’s end. Chesterfield County will no longer honor requests to hold illegal immigrants at the request of the federal ICE unit.